StoreMore Globel Silver Vein Nevada Combo Shelving Unit: The Globel Silver Vein Nevada Combo Shelving Unit is the perfect companion to any garden shed, garage, workshop or office. 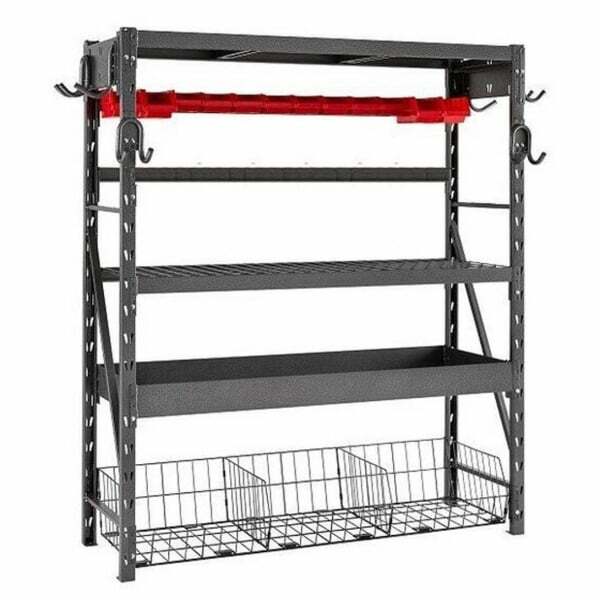 The Nevada Combo Shelving Unit has an industrial feel to it and has room for all your tools, fixings, cleaning materials and other DIY or household goods. This unit includes 8 size 10 totes, 4 size 20 totes, single hooks, double hooks and wire basket giving you a massive amount of storage space for all variety of items. It is made from heavy duty steel and can support more weight than most typical shelves. It is also extremely simple to construct as it uses a unique keyhole locking system which means no bolts are required, only a rubber mallet (rubber mallet not included) making the process quick and easy.